Let's Take A Stand To Uplift Bay Area Foster Kids! At the beginning of her term, newly elected mayor of Oakland CA, Jean Quan, made it a priority to help take back the youth of Oakland. These youth include foster children who have aged out or will be aging out of the system. This presents a problem to the Oakland community and Alameda County because these young people are experiencing hardships with their education. Statistics from Foster Youth Services have shown that above 70% of those in foster care are functioning below their grade levels and 50% have to repeat the same grade level for at least a year. All of these things have an impact on the graduation rates of these young people. It is not their fault! My mom, Cassandra Bailey, became a foster parent in 2009. From the beginning her objective has been to help foster children find their true potential, make positive changes in their lives and become successful. There's much negativity that surrounds many foster children, so having an outlet like a foster parent whose goal is to help you achieve success makes a great difference. My mother has had three foster kids within the last three years. Their stays have varied with the longest staying for 12 months. In that year she helped bring the young lady's self-esteem up, helped raise her GPA and encouraged her to pursue her passion as a veterinarian. As a foster parent my mom has been a positive influence to children in need. 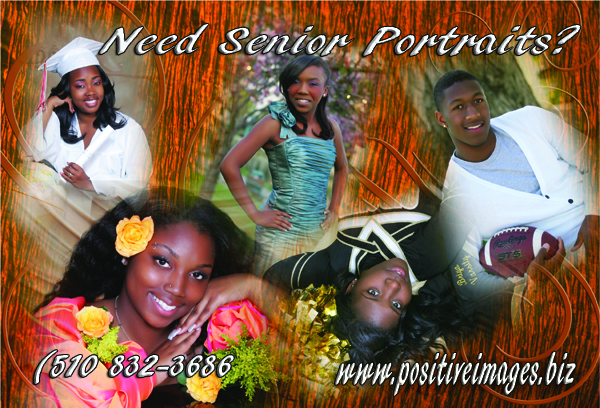 Be a positive influence as well and help a foster child. You can help by becoming a foster parent, mentoring a foster child, or doing any other reasonable service that helps them become better citizens. All local businesses can contribute by going out and teaching foster youth about their professions, helping them to develop interests and passions pertaining to career goals. Interested foster care providers or students may schedule appointments by phoning (510)832-3686. 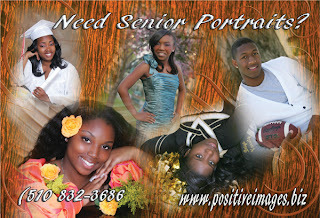 You can view our Senior Portrait Gallery at www.positiveimages.biz. 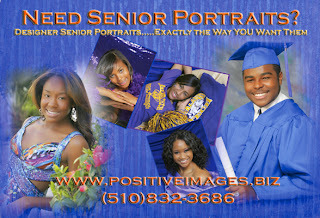 2012 Seniors can "Like" our Facebook Page for updates on scholarships, SAT preparation, college readiness, articles about positive Bay Area youth, and contests. If you or someone you know contributes to a foster child, please let us know what's being done by letting us know in the comment box below. For those of you who haven't gotten involved yet, it's not too late. Will you join in on the cause???? You can forward this Foster Care Senior Portraits Press Release to help spread the word.